There are fewer spaces in the house that are more overlooked, I feel, than the lowly kitchen drawer. Because they are sealed off from constant view, kitchen drawers can become disorganized and messy very easily, especially in busy households. 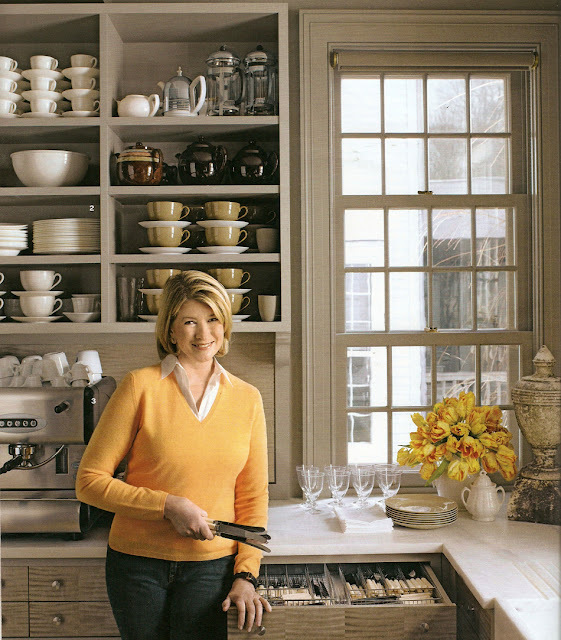 Thankfully for us, Martha has opened her kitchen drawers for all the world to see, and her secrets for organizing them reveal some good ideas that we can all adapt to our own space. Below are photos of some of her kitchen drawers at her main kitchen at her home in Bedford, New York. 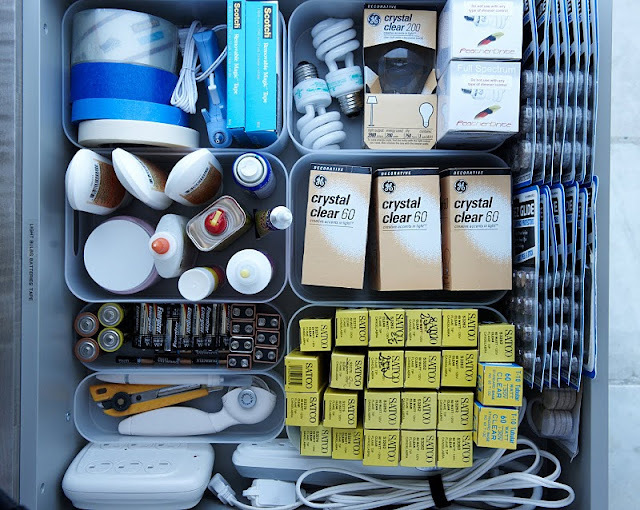 Martha reserves one of the kitchen drawers for utility supplies such as light bulbs, extension cords, glue, batteries, tapes and cutting tools. It's nice to have these items accessible and at the ready, separated and organized in open plastic containers to keep them together. I have a similar drawer in my tiny apartment kitchen. It contains all of the above materials as well as measuring tapes, pencils and notepads. 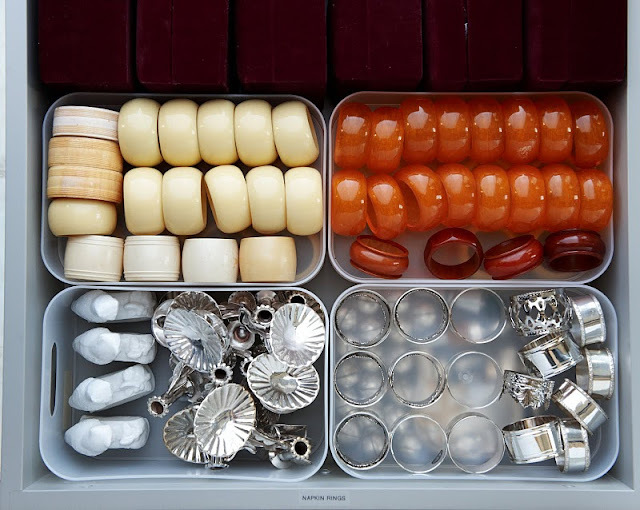 Napkin rings are organized in similar plastic containers, sorted by style and colour. Martha has several other drawers reserved for linen napkins, tea towels, place mats and table cloths. Small jadeite containers from Martha's extensive collection are put to good use in Martha's first-aid drawer. 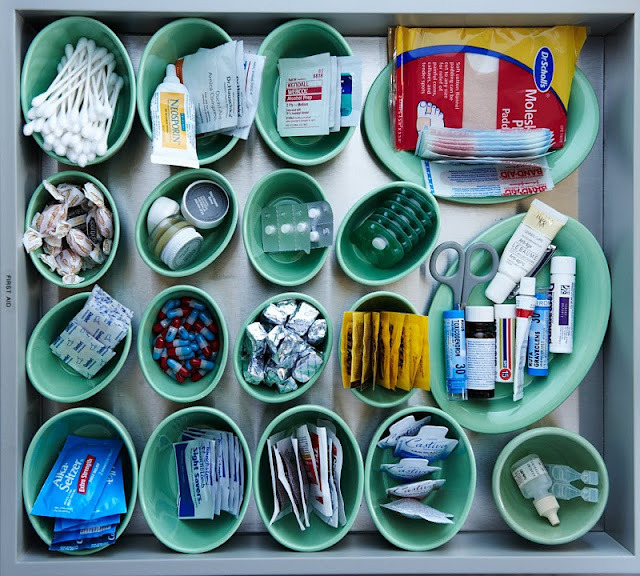 Each one holds a small amount of first-aid supplies, such as bandages, cotton swabs, various pain killers, salves and balms. 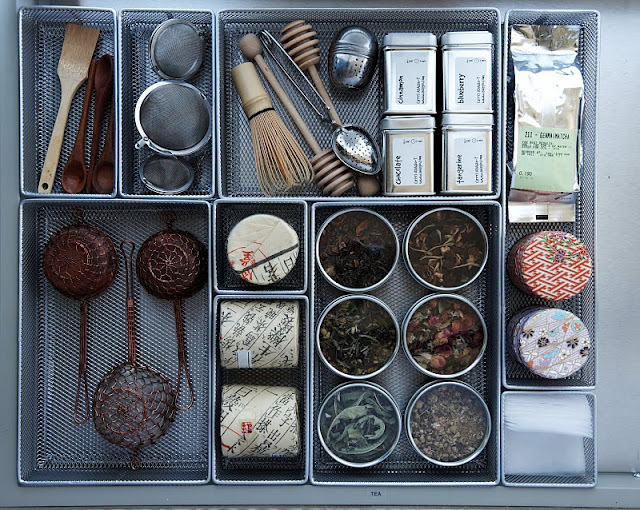 Martha's tea drawer has all of the accoutrements a tea lover requires: strainers, honey spoons, empty packets for loose-leaf teas and wooden Asian teaspoons. Loose-leaf teas are kept in stainless steel containers with see-through lids and labels on the sides for easy identification. Everything is separated by stainless-steel baskets that fit perfectly into the drawer. 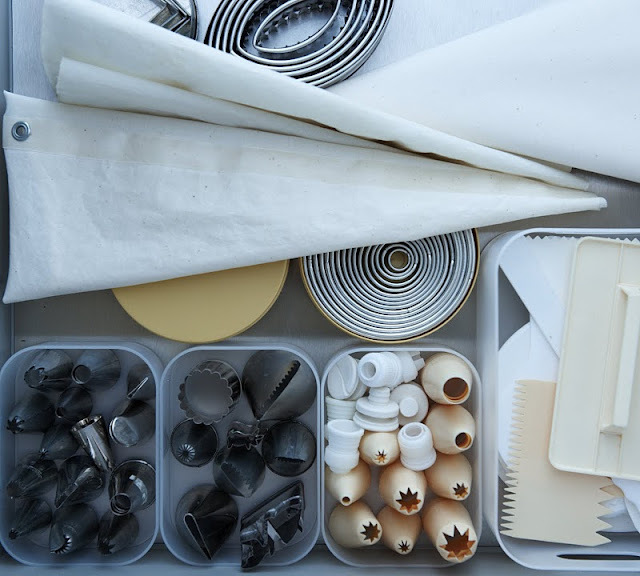 A label drawer is a handy addition to a kitchen, given how multipurpose the busiest room in the house can be; many people do projects in the kitchen that are unrelated to cooking: wrapping gifts, responding to correspondence, etc. Martha keeps luggage tags in various sizes next to her label maker. The label maker itself is labeled: "this stays right here," it says. 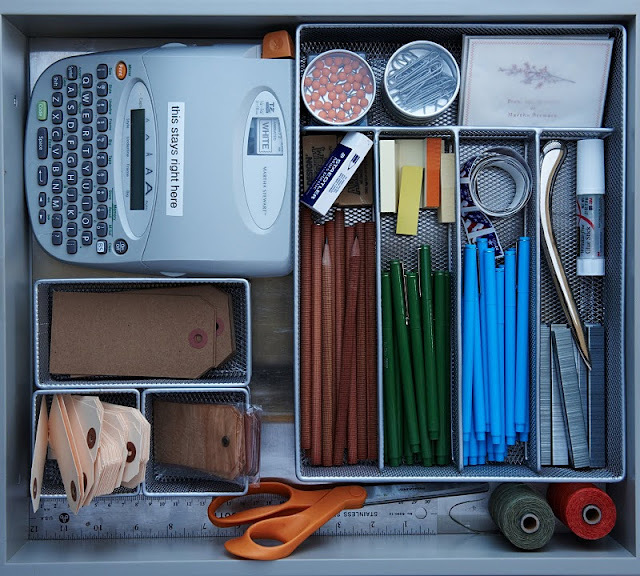 Pencils and coloured markers, staples, rulers, waxed linen twine, a glue stick and a small box of Martha Stewart stationery are all kept in this drawer. Martha has numerous drawers reserved just for baking supplies. The one above shows all of the tools needed for icing cakes, cupcakes and pastries. Sometimes it makes more sense to keep tools that are frequently used out of the drawers all together. 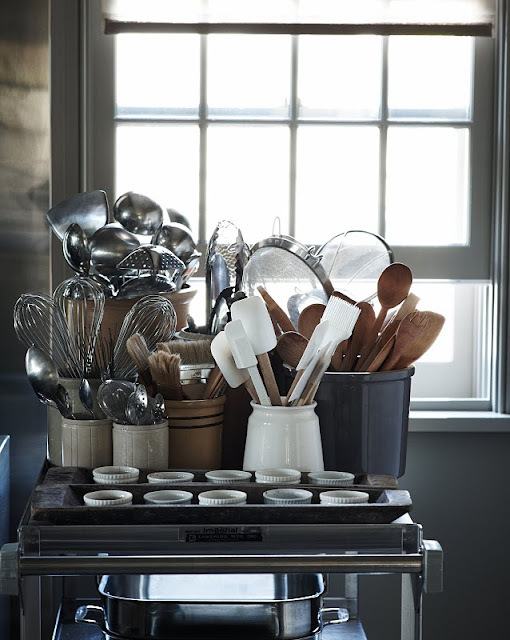 Martha keeps large metal and wooden spoons, spatulas, whisks and brushes in ceramic containers on a stainless steel cart on castors that can be wheeled around the kitchen. The ceramic ramekins in the foreground hold spices, ready for use. I'm still not keen on all the spices and salts sitting on the counter uncovered but that September issue is my favourite and I love the article about the kitchen drawers so much. I thought the same thing about the spices, Pru, especially with cats and dogs running around the room. The issue is also one of my favourites. Great timing! I am re-organizing things in my kitchen and this is great inspiration! I too loved this article and all the organizational ideas. Very inspirational! But then I stepped back and thought about it. . .does anyone, even Martha with all her helpers, really live with drawers like these? Probably not. I think the photos are aspirational, but not at all realistic. Organization is one thing, perfection is another. . . Anonymous, while I dont think all of the things in the magazine are really kept like that or real, the drawers in the kitchen are well organised but also very practical. I reckon the drawers really are as they are shown. I bet the spices sitting uncovered on the counter was just for the photo.I don't think Martha would keep them out all the time.